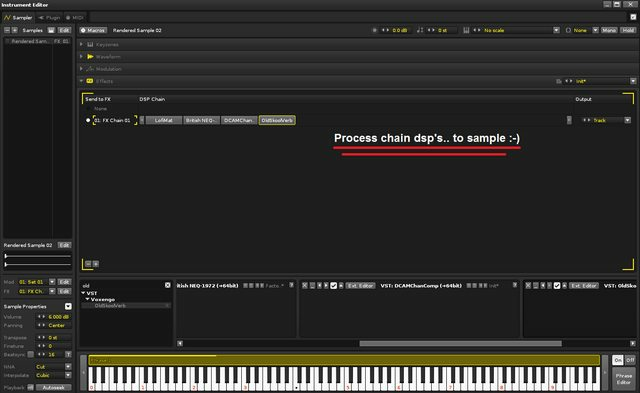 On Renoise Instr, is there a way to process chain dsp to sample? I can not figure out how you render the FX Chains on the Renoise Instrument, to the sample. Is it possible? Just simply render to sample in the pattern editor and the fx chain is simply taken along in the rendering proces, why would that not work (outside plugins and Midi)? , why would that not work (outside plugins and Midi)? An extension of the Render Plugin to Instrument idea perhaps? That, or an extension of process track dsp on sample.